Fused Glass and Fire go naturally together, so it just made sense to create a piece paying homage to the elements of fire in nature. Smoke on the Mountains presents our vision of nature's ferocity and sublime beauty. 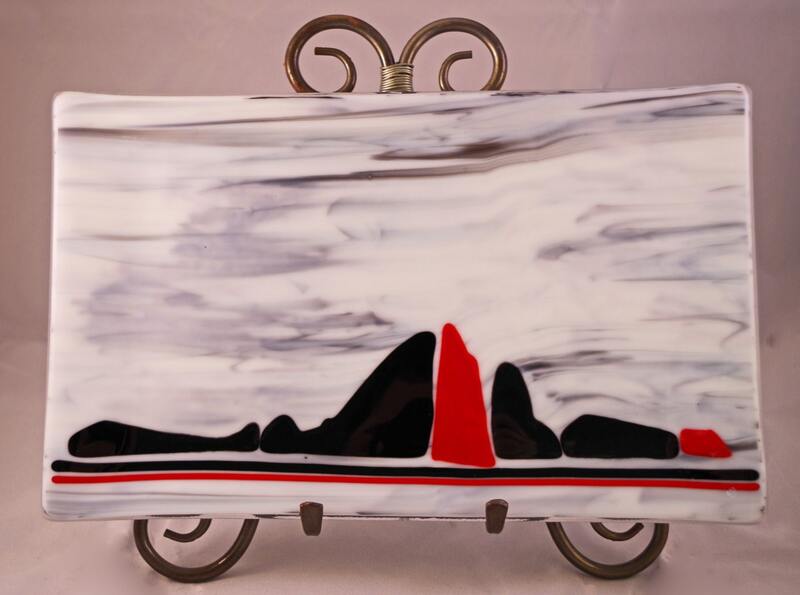 Made of opalescent Bullseye glass in Black, Red, and Smoky White. 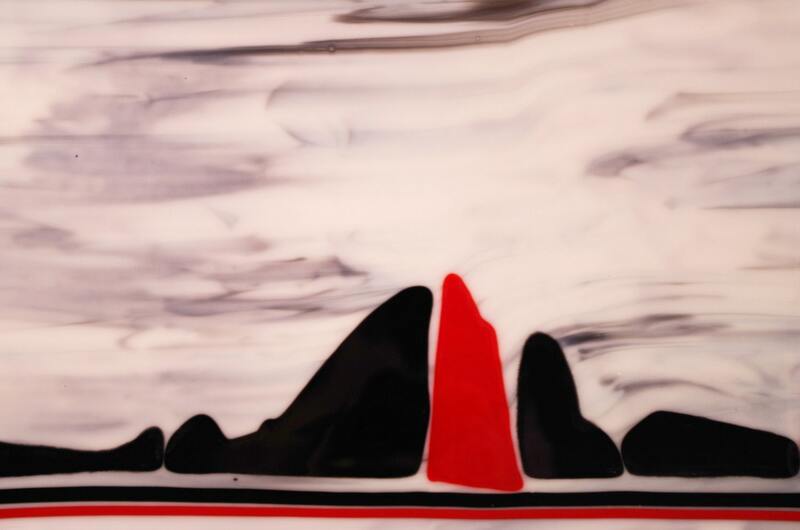 We use two layers of glass in all of our pieces to create a thicker, sturdier piece. The dimensions of this plate are 11.25 x 7.75 inches, and it is slumped gently for a delicately raised edge. 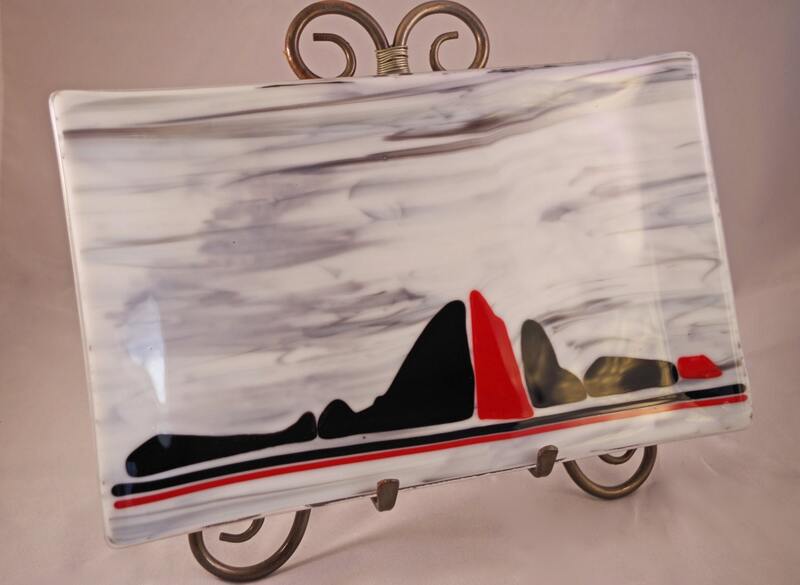 This piece is food and dishwasher safe, but we still recommend hand washing this item as we would hate for you to lose your one of a kind piece of art glass to an overzealous wash cycle. We prefer PayPal, but should you opt to send a check or money order for payment we will require that your payment has cleared the bank before we ship your purchase. Payments must be received within 24 hours of your agreement to purchase the item unless you have made prior arrangements with us. Cancellations of orders must occur within 24 hours as well. All items are sent via USPS Priority mail. We do, however, only receive one pick-up per week on Thursdays, so your paid order should generally reach you within one week. If, however, you have special shipping needs please let us know before you place your order to be sure we are able to accomodate you. We are willing to ship internationally, but will have to figure shipping costs on a case by case basis. Any international customs fees will be the responsibility of the buyer. All items are shipped insured for their full value, this cost is already calculated into the shipping and handling fees. We do not ship items without insurance. We cannot offer refunds or exchanges as our pieces are primarily one of a kind. We provide insurance on every item, so there is never need for concern over pieces getting broken during shipping as these will be protected by insurance and good packaging! We are willing to entertain custom orders through consultation with either of our artists. We are also willing to discuss wholesale and consignment with authorized retailers.